Big news, HubSpot Marketing users. If you haven’t heard or caught the email in your inbox, effective May 31, 2018, HubSpot is sunsetting its six-year-old Keywords tool in favor of focusing on Content Strategy, a tool announced in 2016. But before you panic (which I admit, I did a little), here’s what you need to know. As a content marketing manager, the keywords tool has long been a pillar of my existence and many of my colleagues echoed my sentiments. Similar to many of you, here at IMPACT, we still actively turn to Keywords both internally and for clients, and as far as we can tell, we’ve seen immense success with it. So, this news hit hard. It felt like a drastic, uncalled for move by a tech giant -- think Apple pushing users to give up their beloved headphone jack with the rise of Bluetooth. It wasn’t that keywords were irrelevant, it was that HubSpot saw a shift occurring with topic clusters and SEO and wanted to spearhead the behavior. Stripping the tool felt like an inconvenience; one that would be forcing us to turn to other platforms for keyword insight rather than our “all-in-one” -- and it is -- but it’s all with the best intentions. Earlier this week, we sat down and spoke to HubSpot’s Jeffrey Vocell and Angela Defranco about the deprecation of Keywords. They shared that use of HubSpot Keywords has been falling dramatically in recent years and with increased security and unpredictable algorithm updates from Google, it has become harder for it to provide reliable, useful information. Roughly 90% of source keywords are listed as “unknown” creating an incomplete picture of what actually drives traffic, leads, and sales for users. Keywords is no longer bringing to the surface the largest content opportunities for brands. HubSpot “needs to help users plan, validate, execute, and measure their content creation,” explained Angela, and the Keywords tool is no longer effectively doing that; Content Strategy can. That being said, I admit my panic was a tad over-the-top. 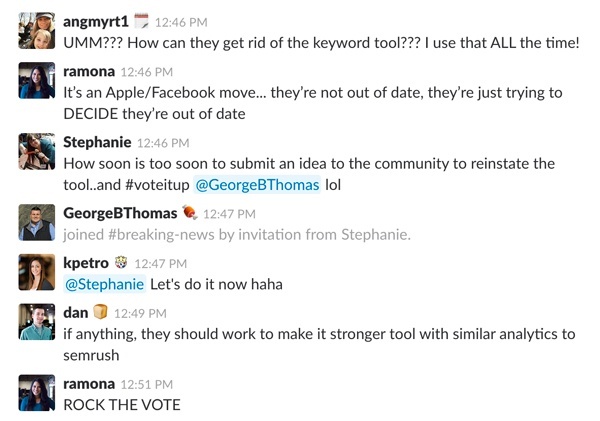 The removal of the tool is happening not to annoy or inconvenience users, but rather to give us the best solutions possible. In a recent study by Ahrefs, it was even “...found that a number one ranking result (i.e. a topic-based page) can rank for 1,000 other keyword searches…” so content strategies and tools like HubSpot need to take this into account. Using HubSpot’s Content Strategy you will be able to plan, organize, and execute on SEO that matches the way search engines and buyers actually work today -- but that’s not without your keywords. Despite the end of the tool that shares their name, both Jeff and Angela acknowledged that keywords are not dead and remain extremely important to the topic clusters created in Content Strategy. “A topic [cluster] is largely just a group of hundreds or even thousands of [related] keywords,” Jeff remarked. Unfortunately, they have just become harder to understand in recent years and, in turn, HubSpot’s tool has become less effective. 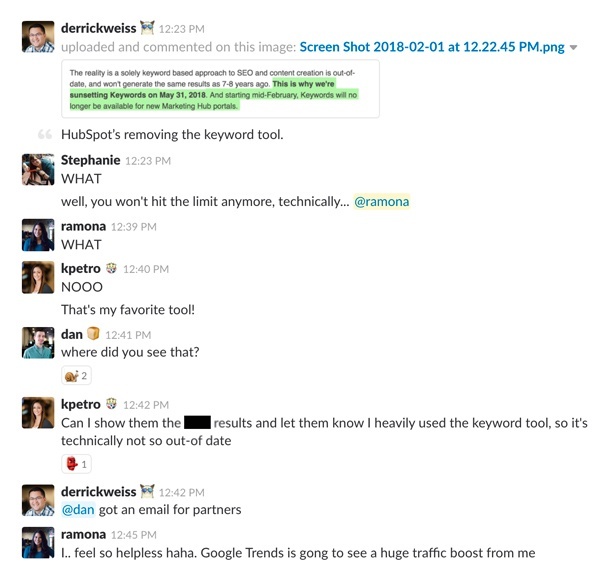 Rather than continue to try to make a dated tool work, HubSpot wants users to know there are several tools more advanced and effective for keyword research (which we will get into). This insight is still vital to the success of your content (and use of Content Strategy), it just shouldn’t be done in HubSpot right now. Want to hear more from Jeff and Angela? Check out George B Thomas' full interview with them here. So you clearly need keywords, but you can’t research or track them in HubSpot anymore. What do you do? Jeff and Angela assured us that HubSpot is working on making the transition to Content Strategy as seamless as possible. So we'll be keeping our eyes peeled for news on that, but until then, here are a few suggestions from the team over at HubSpot as well as yours truly. This is a tool we’ve been using heavily at IMPACT to analyze volatile aspects of our technical SEO including crawl errors and broken links. It is also, however, arguably the leader in keyword and rank-tracking tools for SEO professionals today. SEMRush offers specific data across broad and location-based keywords that can help you investigate content topics. It also has several niche tools in beta including a PPC keyword analyzer, content analyzer, and topic research. I recommend exporting a CSV of your HubSpot Keywords and the attached data. This will likely come in handy with some of the new features. I personally haven’t used this one, but I know it comes highly recommended by many leaders in the industry including HubSpot. In the marketing automation company's words, "Ahrefs has a great linking tool that has recently expanded into Keywords. The tool is a worthy competitor to SEMRush and is worth checking out if you are exploring SEO tools." 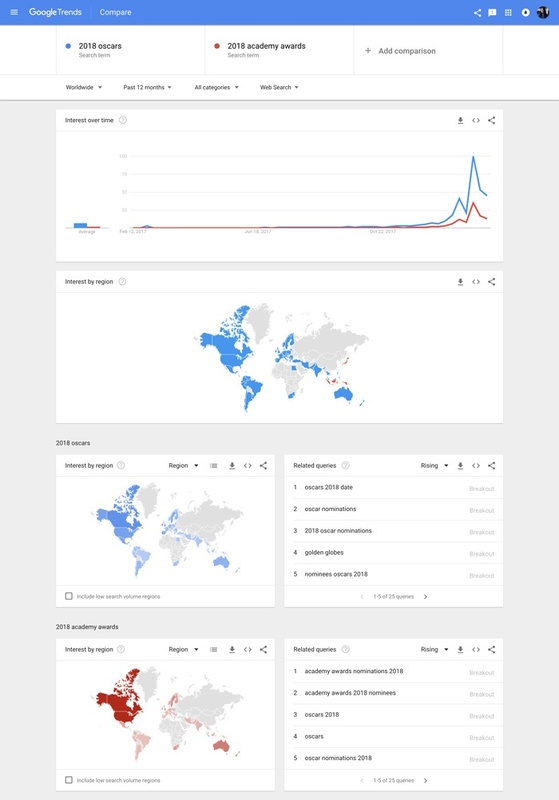 Now, while not as detailed or comprehensive as other tools, Trends is something I use to quickly gauge global interest on a particular topic and also compare multiple. If you’re writing about something interesting that may not directly fit into a larger “topic cluster” on your site, this is an easy way to research which phrasing it would most likely be found under. Check out this comparison I did for "2018 Oscars" versus "2018 academy awards." Last, but not least, while intended to help people get the most out of Google Adwords, Keyword planner is also a handy tool for getting historical statistics (such as search volume data for new keyword ideas) or getting forecasts on keyword ideas like estimated conversions and clicks. Search engine optimization, like many things in life, is always changing and often out of our control -- but that doesn't mean you can't succeed. Give the tools mentioned above a try and stay tuned for more updates on HubSpot's suggested next steps.